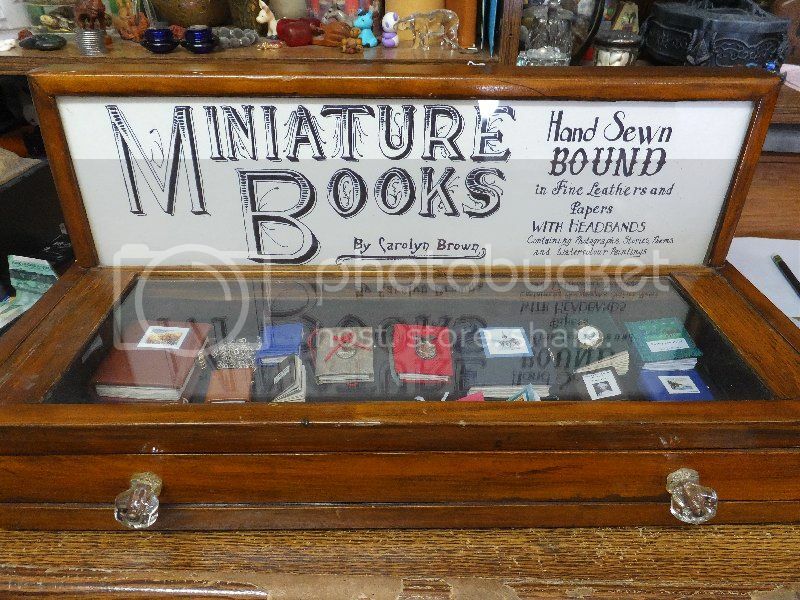 well-known for its devotion to the fine art of Watercolour painting. We hope you can join us for the opening night, or come and enjoy the show throughout the month. representing the watercolour artists of the Peace region with her painting New Occupation. instruction and advice. It's a pleasant afternoon in the park. Fairview Fine Arts Centre is hosting a day to celebrate arts of all sorts for Alberta Arts Day! On September 28th, drop in and watch demonstrations, see the CJ and June Lyons exhibit, peruse the gift shop full of the work of local artists, and maybe try your hand at something new. The more the merrier, so bring your friends as well to celebrate art in Alberta! Carolyn and Judy will be teaching a children's art class at the Fairview Fine Arts Centre on October 9th, packed with all sorts of fun and creativity, but also some serious learning. 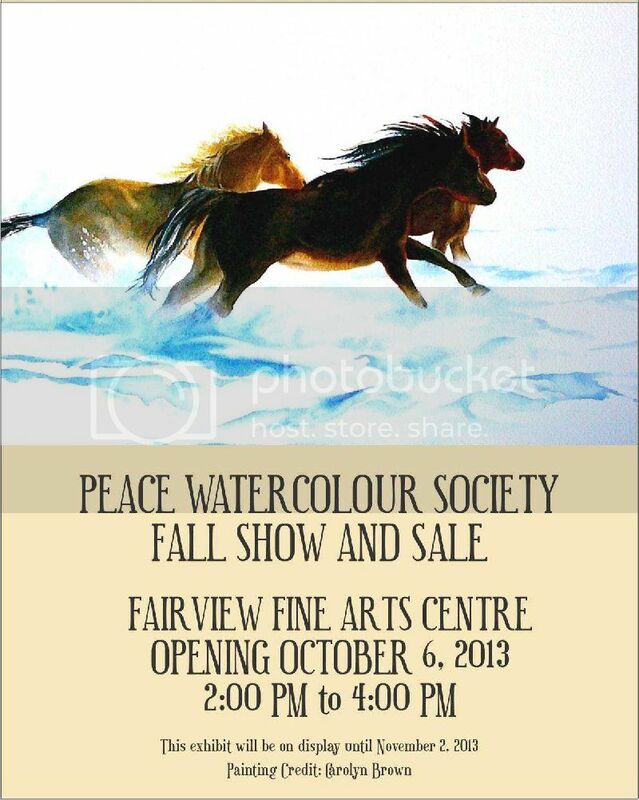 Same goes for Wine, Women and Watercolour, a relaxing evening for friends or strangers on October 10th, upstairs in the Fairview Fine Arts Centre surrounded by inspiration: the Peace Watercolour Society Show! Summer was rainy, then hot and dry... good weather to paint in the basement! But plenty of exploring was done, outside and in, and lots of photos taken. Judy and Carolyn are all ready for the Peace Watercolour Society Show in Fairview this October (except for framing, of course). One lovely day at the Dunvegan Fresh Air Market was also a grand day for sales. Judy and Carolyn enjoyed a watercolour session at Long Term Care with Grade Fives from Ste. Marie School. We painted a whole garden of fall flowers, and had time left to imagine spring. Those kids left LTC a much brighter place! 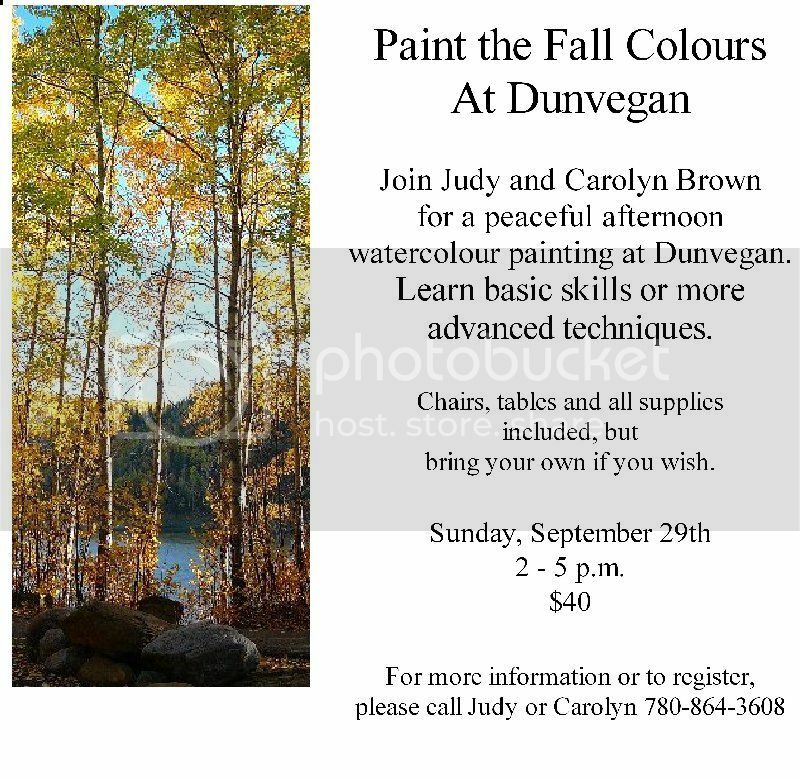 The Peace Watercolour Society members met at Kiskatinaw Provincial Park on the old Alaska Highway just west of Dunvegan. It was a ridiculously hot day for mid-September, and there were swimmers with brightly coloured suits, umbrellas and boats gathered under the curved wooden bridge. Plenty to paint - if the paint would stay wet!